Occupy Wall Street protesters have staged rallies across the US as they called for a nationwide general strike to mark International Workers' Day. 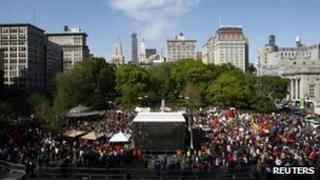 Thousands gathered to protest peacefully in Union Square in New York City. That rally came hours after arrests and a confrontation with police on the city's Fifth Avenue. In Oakland, California protesters clashed with police as flash-bang grenades and tear gas were used. Demonstrations and strikes were also held in Washington DC, the Los Angeles International Airport, Atlanta and in Chicago, where about 2,000 activists marched through the city to callfor immigration reform. The Occupy movement won national attention in late 2011 with widespread protests against economic inequality. The May Day activities marked the most visible action from the group since authorities dismantled their main camps across the US last year. An organiser in New York said the mood had changed. "There was a sense of novelty to Occupy in October," Mark Bray told the Associated Press. "Today is more celebratory, and nostalgic." Occupy Cleveland cancelled its own events "out of respect for the city" after five self-described anarchists were arrested in the area on suspicion of plotting to blow up a four-lane highway bridge over a national park. In a statement, the group said they were in "no way representing or acting on behalf of Occupy Cleveland". In recent weeks, smaller groups of protesters have taken to camping out in new locations, including across the street from the New York Stock Exchange. An Occupy Wall Street text alert on Monday said: "All civilians stand by for GENERAL STRIKE at 08:00. No Work, School, or Shopping. All out in the streets!" On Tuesday morning, there were about 100 activists demonstrating in Bryant Park, New York, ahead of a planned "pop-up encampment" in the heart of Manhattan's midtown. About two dozen people gathered at a Bank of America building, which was ringed with metal barriers and guarded by police. "Hey, hey, BOA, who did you foreclose today?" protesters chanted, according to the AFP news agency. The Deutsche Bank atrium downtown that was once used by demonstrators as a popular meeting area was closed to the public. Labour groups such as Domestic Workers United and United Auto Workers said they would join some Occupy Wall Street demonstrations. "This isn't a sprint, this is a marathon," said Scott Sommer, New York Area regional director for United Auto Workers. In San Francisco, protesters initially called for activists to "occupy" the Golden Gate Bridge in a show of solidarity with bridge workers who have been engaged in a contract dispute over wages and benefits. But organisers backed away from the plan. During the morning rush-hour, some protesters stood with signs nearby and did not try to disrupt traffic. Scores of police lined the road. In the San Francisco Bay Area, service on the Golden Gate Ferry was temporarily shut down. Across the city, nurses on strike marched and chanted outside hospitals. In downtown Oakland, police used gas to disperse protesters, and at least four people were arrested, the Associated Press reported. The Los Angeles Police Department deployed hundreds of officers ahead of rallies planned for downtown on Tuesday, the LA Times reports . It is not clear whether the May Day activities will be enough to bring Occupy Wall Street back to prominence. The movement began in September 2011, when protesters gathered and camped overnight in Lower Manhattan's Zuccotti Park. Solidarity movements sprouted in cities across the US and overseas. More than 700 people were arrested in New York in October during a march across Brooklyn Bridge. Some of the fiercest clashes last year between police and protesters were seen were in Oakland, California. Does Occupy signal the death of contemporary art? Do the super-rich pay their way?